The media industry is very good at talking about how trends and technology can reshape the ways in which brands reach consumers, but all too often the human at the receiving end of the innovation is neglected. Our approach offers something different. Our trends are built upon a unique and extensive consumer research programme, Mindshare Futures, that places people firmly at the heart of our conclusions. Given the polarisation of opinions taking place within the UK, this year we’ve placed even more emphasis on exploring how our trends differ in terms of adoption and relevancy across the whole country. We’ve investigated everything from AI and data to AR and image recognition, and we can see that whatever else they might disagree on, people are still open to embracing many of these technological advancements, especially if it enhances the way they live their lives. With 100,000 chatbots on Facebook Messenger, in-store virtual assistants guiding shopping experiences, and walk-in stores that are staff-free and run entirely by technology, human interaction is declining. As automation becomes more widespread in everyday life, people will start to think more consciously about its promise of greater convenience versus the loss of human interaction. 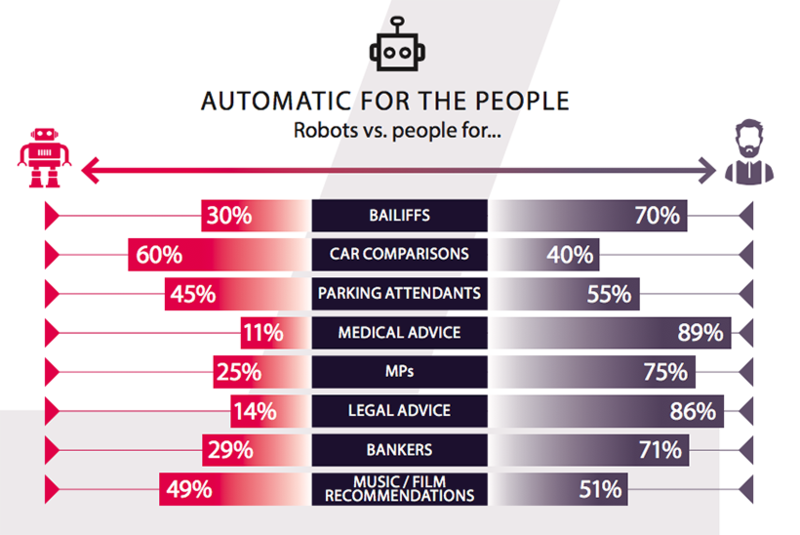 Many people weigh up their options when choosing between automation or people-based services. They are happy to turn to automation for singular process-driven tasks, but for anything more complicated, with risk associated, they would prefer to defer to a human being when given the choice. However, 57% say they can visualise a time in the next few years when machines can do tasks more effectively than we can. Our data footprint is growing in magnitude and range, and most of us are acutely aware that we are giving away increasing amounts of personal data. For many people, an uneasy sense of inevitability exists about the data exchange; they don’t like it, but it’s something they have to relinquish to get access to the things they want, and they don’t know how they could approach it differently. Two-thirds of people admit that, while they know their data has value to companies, they don’t yet know how to use it to their own advantage. Another factor is that data is not a high priority for them; but this doesn’t mean they don’t care. With GDPR on the horizon, people will radically reappraise their attitude and behaviour toward it. Uncertainties about data management will start to disappear as people develop a deeper understanding and learn how to practically address it better, with companies offering more solutions in this space. Smartphones have made us accustomed to accessing almost anything we want, whenever and wherever we want it. 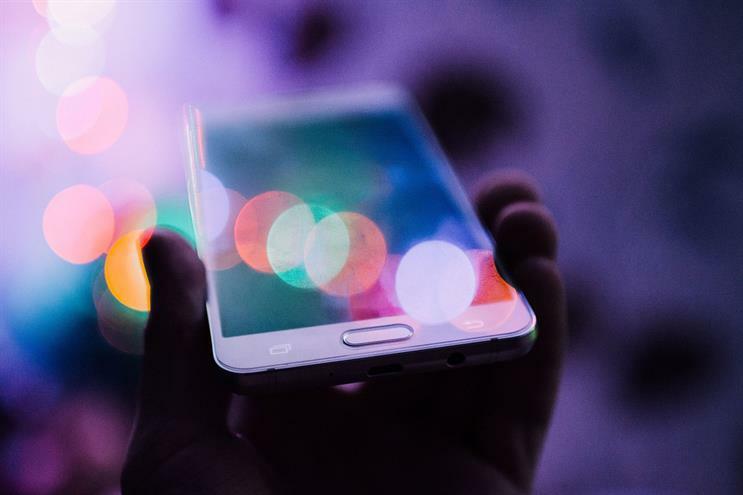 As we progress beyond the mobile device, this level of access and connectivity is set to become even more pervasive. We will come to expect smooth and seamless access to everything, with new devices that link up more effectively – from integrated voice assistants to hearables and smart glasses – all fuelled by a supercharged infrastructure. People are generally excited by the idea of new devices (although this feeling varies by age group and location across the UK) and they especially like the idea of better connectivity offered by an improved infrastructure. However, they struggle to imagine a future of connection that exists beyond the screens we are comfortable with today. Of all our five trends, this was the one that evoked the most positive feeling. Life is presenting us with too many options to deal with, and this has started to feel overwhelming at times. Technology, however, is helping, injecting the fun, imagination, and inspiration back into everyday decision-making and the exploration of new ideas. Whether it’s algorithms recommending new music, virtual assistants suggesting new recipes, smart mirrors helping us visualise an outfit or AR apps that help us try before we buy, technology is helping us answer questions such as "What’s new?" "What else might I like?" "What would it be like to…?" People are becoming more comfortable with algorithms and social-media recommendations, and are also interested in what some of the newer technologies could offer. Unsurprisingly, seven in 10 people said they would find it helpful to visualise goods or services before purchasing them. Our culture has become more visual. Combine this with the rapidly improving image-recognition capabilities of AI, and we are set to see further developments in areas such as visual search, code-scanning and facial recognition. We will increasingly turn to images for quicker and easier interactions – helping us find, record, unlock, activate, identify, match, buy and much more. There were some real differences in the data for this trend. 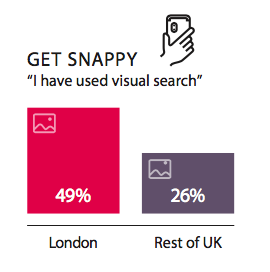 Its ‘short-cut’ nature appealed more to younger people and those from urban areas who were more likely to have had experiences using visual search, facial recognition and code-scanning already. Overall, the reaction to this trend was particularly positive; the only element that people had concerns around was the accuracy of facial recognition for functional, access-based tasks.